There's never been a better time to become a nurse, and careers in healthcare support are booming, too. In fact, the government projects there will be more than 580,000 new jobs created for nurses through 2018. America’s baby boomers are aging, and Americans are living longer than ever before. Couple that with the American Association of Colleges of Nursing's prediction that there will be a serious shortage of trained nurses, and that equals healthy employment opportunities for you. The best news of all? Whether you’re pursuing an associate's degree or a bachelor's degree in nursing, you can get there faster—and spend less money—by taking your required courses from StraighterLine. These days, nurses enjoy increased responsibility and authority in hospitals and healthcare facilities, even moving into administration. Nurses are also far more respected than they were in the past, as more people have come to recognize the incredible combination of caring, concern, and knowledge it takes to keep things running smoothly. Online degrees in general have gained more acceptance in recent years. And when it comes to nursing degrees, the Pope Center for Higher Education Policy reported that 97% of employers rated graduates of Western Governors University (a nonprofit, online-only university and StraighterLine partner school) equal to or better than graduates of other universities—and 94% of employers were willing to hire WGU graduates. 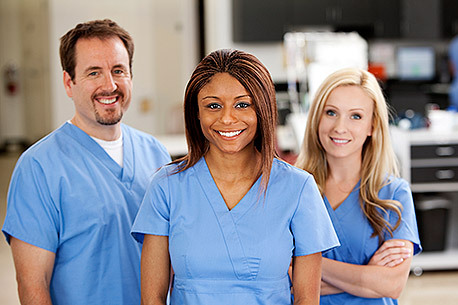 Western Governors University's College of Health Professions offers a full selection of online nursing degrees, including Bachelor's of Science in Nursing, a Master's of Science in Nursing, and an MBA in Healthcare Management. Most nursing and medical schools, as well as most online nursing programs, require a set list of basic courses. So before you can add an LPN, RN, or an APN to your name, you'll need to take them someplace. Since StraighterLine's course credits transfer to any of our partner colleges or through the ACE CREDIT service to over 1,800 colleges and universities in the United States, why not save yourself time and money and take them from us? Nursing: Do You Have What it Takes? Know Your Options, Know Yourself.